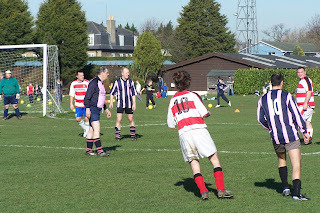 With the First Team game having been switched to Good Friday, this now leaves the Saturday clear for us to compete in a memorial tournament being organised by Old Westminster Citizens Football Club; of which our own Ian Gannon is a member. I'm not entirely sure of how it will be done, but I beleive it's a mixed competition, and we will be entering a joint side with Peckham Village WFC, for whom another of our players Dawn Taylor plays for. 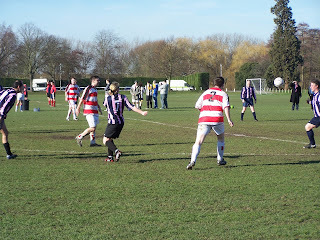 EASTER SATURDAY TOURNAMENT – FOR STEVE BENJAMIN – SATURDAY 22nd MARCH 10am – 1pm 1.TEAMS WILL PLAY 30 MINUTE GROUPS GAMES x3 2.WINNERS OF EACH GROUP WILL PLAY RUNNERS UP OF THE OTHER GROUPS THE WINNERS THEN TAKE PART IN THE FINAL. 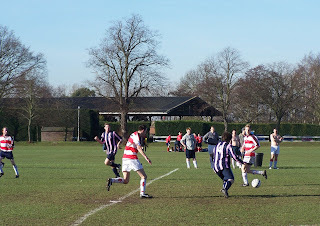 THE THIRD TEAMS WILL PLAY EACH OTHER AND THE FOURTH TEAMS WILL PLAY EACH OTHER. 1.POINTS ARE SCORED IN THE USUAL WAY PLUS 1 POINT FOR EACH GOAL SCORED. 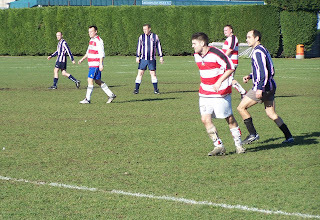 THEREFORE A 4-2 WIN GIVES THE WINNING TEAM 7 POINTS AND THE LOSING TEAM 2 POINTS. 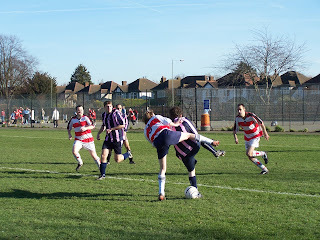 4.NORMAL 11 A SIDE RULES APPLY. GROUPS WILL APPEAR HERE SOON. ANYBODY CAN PLAY – ITS TO BE PLAYED IN A TOTALLY FRIENDLY SPIRIT. When I find out more I'll publish it here. For our Summer Tour we will be going back to Tallin, the beautiful caputal of Estonia. We will again be playing our good friends from JK Jalgpallihaigla, who beat us 10-6 last summer. The tour will be on the weekend of 25th to 28th July. It's suggested that people get either the Thursday or Friday morning flight to Tallin, with Easyjet (linked from the Anoraks Corner column, down on the right of this blog, near the ned of it, under Travel). We are planning to play them on the Friday evening, then head to Helsinki for a game, in the process of hopefully being arranged, against either HJK Helsinki Supporters', or a local eighth level side in the Finnish pyramid. We would get to Helsinki by boat from Tallin, which is a two hour crossing, and will get the boat back, if all goes to plan, late on the sunday evening, having taken the opportunity to watch a HJK Helinki top flight Finnish League match. We would then suggest people fly back from Tallin on the Monday lunchtime flight. Unless you choose to have a longer break yourself. If you would like to put yourself forward to play, and you don't have to be a regular to turn out, then please speak to Mick O' Shaughnessy for more info, as and when it becomes available. Supporters' are more than welcome to come along on the tour even if you have no desire to pack your boots! 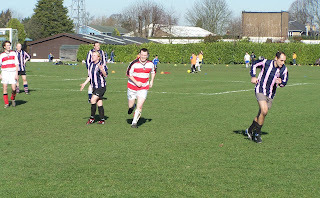 so to speak, as "The Rabblers" crashed out of the IFA Cup at Belair Park this morning. Of course there are bound to be a few 'shirkers' when the boss is away. And this seemd to be the case with our new man at the helm basking in the sunnier climes of Spain this weekend! 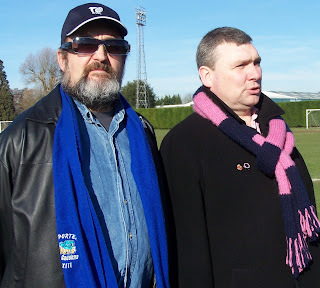 His right hand man Mark Hutton couldn't be said to be at fault, as it was the other half of the 'three-eyed monster' that is Hutty & the kit man Phil Baker, who took control of team affairs for the morning. Something hopefully never to be repeated as "The Rabblers" crashed to their all-time IFA record defeat, going down by thirteen goals for no reply! 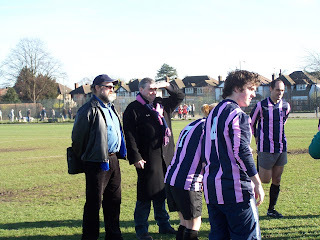 This equalled our previous record defeat, way back in early 1995, when we lost 15-2, in a friendly, against a Dulwich Hamlet Junior FC parents & coaches XI, on the Crystal Palace all-weather pitch. That was the 'infamous' game where Mishi Morath accidentally stabbed our keeper Matt Hammond in the hand, resulting in nerve damage and a weekend in hospital, causing him to miss out on his Sunday team Cup semi-final! To be fair, the result this morning was partly of our own making. 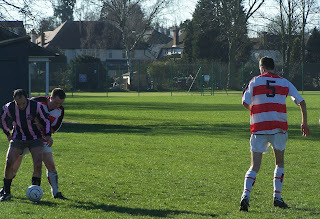 Our perofrmance was below par, and probably our worst of the season. 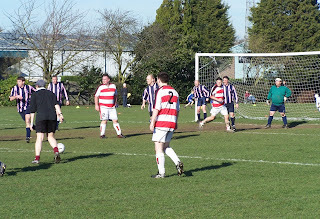 But that's not to detract anything from current IFA League leaders Watford, who were still a more organised outfit than ourselves. They would certainly have still eliminated ourselves from the competition, but not by such a great margin! 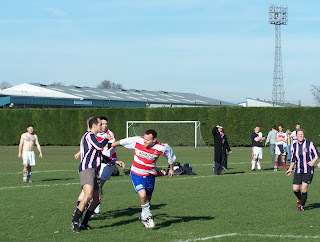 Other than the score, they were decnet opposition to play! 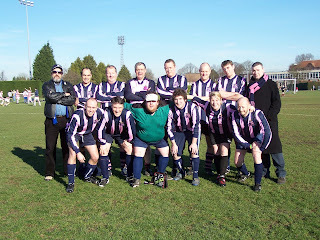 Matt Hammond; Chris Wheeler; Steve Rickerby; Jon Tennison; Jack McInroy; Andrew Tucker; Andy Murphy; Chris Garrett; Keri Ryan; James O'Shaughnessy; Lawrence Marsh. Subs used: Joel Virgo; Dawn Taylor; John Prendergast; Ian Wright; Chris Tabrett. ...unlike the Hamlet first Team, in the 'big boys' game in the afternoon at Kingsmeadow, athough we did go down by the higher scoreline! 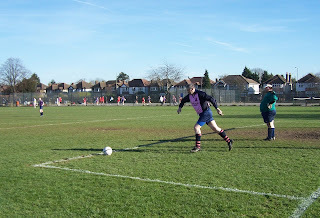 The game was on the outer pitches, at the Metropolitan Police complex,Imber Court, East Molesey, but it wasn't a case of 'we woz robbed' more of us being 'under the cosh!'. 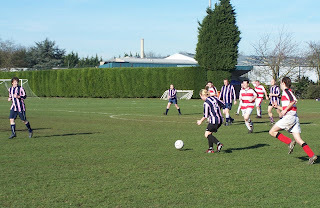 It was a younger, and quicker K's outfit that once again had, what is becoming, their annual home victory over us, to complete a comprehensive IFA double. 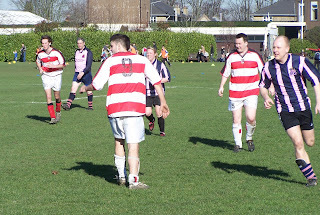 Matters weren't helped as a large squad, on paper, was decimated by late pull outs due to work commitments and injury, this on the day we just had twelve on parade, many the usual motley assortment of old, limited, some with a bit of talent, but all still with the famous Hamlet heart! The less said about the game the better really, except it was an inproved Rabblers second half performance, having gone in at the break three behind. 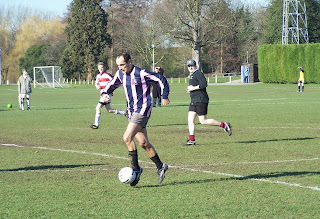 A goal was pulled back by Chris Garrett, who maintains this seasons' crown of our top domestic goalscorer, but that was it, with any chance of a Hamlet rally finally snuffed out as Ian Wright turned the ball into our own net, past a hapless Hammond, who had no chance with it, for their fifth. 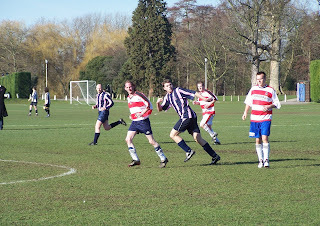 Two late goals flattered the K's somewhat, but did not mask the fact that were well and truly deserved victors. Not the most auspicious start for new manaager Mick O'Shaughnessy, who may be tempted to pull his boots back on for the IFA League & Cup 'double header' at Belair Park next week. There follows, below, some photos I took during the game. 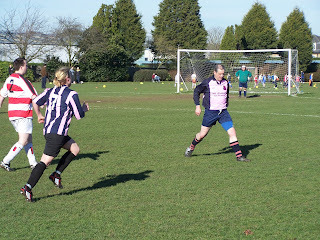 Thanks to Jack McInroy for allowing me to use his camera, & for posting them on here. Just click on each snap to enlarge it. Team: Matt Hammond; Phil Baker; Steve Rickerby; Jon Tennison; Chris Wheeler; Jack McInroy; Dawn Taylor; Keri Ryan; Lawrence Marsh; Chris Garrett; James O'Shaughnessy. Sub: Ian Wright. I've received a nice email from our good friend Nicolas Lucas, who set up the match against the UR Namur fans.
" I send you this e mail to thank you for your presence last week end. I think I can speak for everyone involved in the Namur team and to tell you that it was a great week end. I'd like to thank all the Namur players and fans involved in that week end!!!! And also a big thank you to Gabor Bukran and Amhed Gursever ( First Team players ) for their support and presence during our game. I'll try to scan any articles issued in the local press. They spoke about our game and a little about your club. And there's also a pic of both teams. I think a few moments will be forever in my memory....By example : the kick off given by Gabor Bukran, the kick off given by Andy and Lawrence in front of 1500 people cheering and shouting, the friday night in the café upstairs ( great atmosphere, lounge music,....), the VIP meals at the "Stadium ". What to say again about our game : 6-6.....Like always it was a crazy but friendly game. I know that you'll tell me " You never beat the Hamlets"....I know I know....But I'll be back. I hope we can arrange a game in May to play you at Belair Park or Champion Hill ( who knows???) . 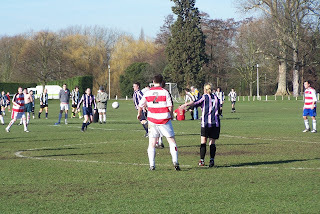 So and forever there'll be always a link between Namur and Dulwich. Cheers Nicolas, we all look forward to seeing you at Champion Hill soon! And we even made the local press! It's easy to blow up and read, if you understand French! Just click on the middle report, then click again on the magnifying glass symbol, above it, just to the right.